Fast Joint Care+ Review – Is This Product Safe To Use? Fast Joint Care+ is a natural joint care supplement that is known to promote and improve the health of joints. It contains an effective ingredient that has been proven scientifically to offer joint cushioning and support. For this reason Fast Joint Care+ has been made for people with poor joint health since it has the ability to restore damaged and worn out joints. Fast Joint Care+ is available to be purchased without a prescription. This is very beneficial since it can be ordered online. In fact, the official merchant store sell the product for $34.99 for a 60 capsule bottles respectively. This price may vary with shipping and handling costs. 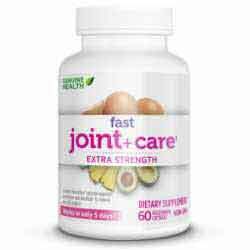 Fast Joint Care+ is a dietary supplement that taunts itself to promote the health and functioning of joints. The producers claim that it is works in case where we need to fight inflammation. It has been recommended for any one suffering from dry and inflamed joints. Amongst the many users, it has been received well by top athletes and people suffering from joint degradation and arthritis. The producers of this product are known as Genuine Health. They are known to produce natural supplements that can be readily bought over the counter. A spot check by us revealed that Fast Joint Care+ ships to most parts of the world. Natural Eggshell Membrane (NEM) – NEM is made up of several different compounds that work together to equip the body with essential nutrients that we need for every day joint health. It makes the joints more flexible and thus improves the range of motion. Fast Joint Care+ is not fortified with vitamins and minerals. The recommended dosage varies from situation to situation. Luckily, the producers have given the breakdown on the product label. What are the side effects associated with Fast Joint Care+? Fast Joint Care+ is safe and effective to use. By the time of writing this review, they were no reported side effects of Fast Joint Care+. This product contains fish extracts. Users who are allergic to fish should avoid taking this supplement. In case of severe side effects, consult your caregiver immediately. Do not use this product on pregnant and breastfeeding women. Fast Joint Care+ is an amazing product on paper. It is well priced, has some good reviews from the users and uses some reputable ingredients. All the same, the product conspicuously lacks very important mineral supplement that should be in every joint care product. We expect to have minerals such as calcium and magnesium in such products in order to boost bone formation and improve the health of tendons and other connective tissues. Previously, we have featured fortified products that might be of interest to you. Feel free to explore the products we have featured.